Almost all metals in the universe were produced in stars through nuclear fusion. As stars died, they released these metals into their surrounding environment. These heavy elements were then incorporated into later generations of stars, which eventually exploded as supernovae and released more metals into their surroundings, and so on. But can we get even more specific? Instead of just considering how metallicities change as a function of radius, can we start to consider how metallicities change around the disk of a galaxy? 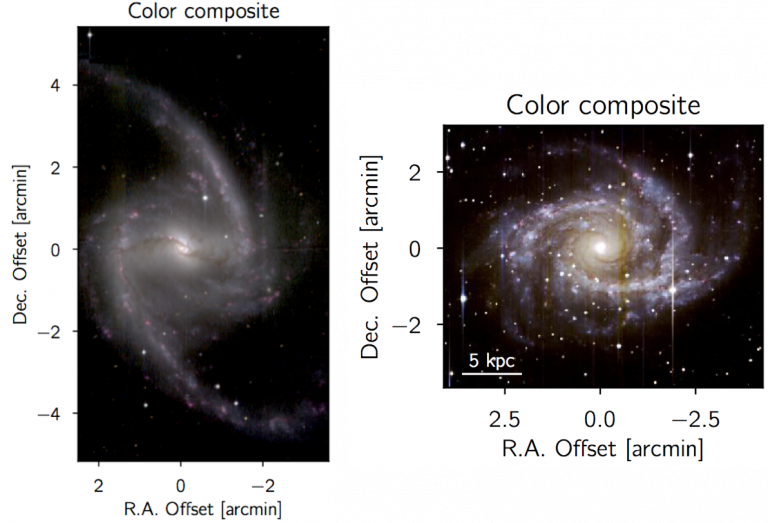 Satellite Galaxies All in a Row—How So? Hyper-velocity stars (HVS) are so named because they speed through our galaxy really, really fast. So fast, in fact, that they can escape the gravitational pull of our galaxy (about 300 km/s for the Milky Way). This means that either they are flying in from somewhere else altogether, maybe a dwarf galaxy that collided with us, or they were accelerated to such high velocities by a dramatic event within our own galaxy. There are two widely accepted theories about what this event could be, and HVS stars are often divided into two categories based on which origin story they fit best. One theory proposes that when a binary star system gets too close to the supermassive black hole at the center of the Milky Way it is ripped apart by the strong gravitational forces, leaving one star in a close orbit around the black hole and ejecting the other. 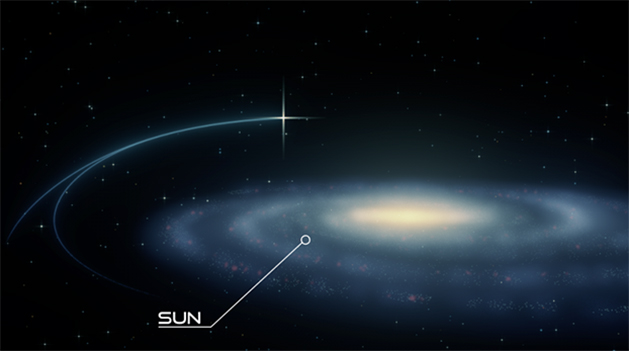 However, some HVS have been seen travelling from other parts of the galaxy. These can also be explained with binary star systems, but in this case it is the force of the supernova explosion of one star that ejects its companion and accelerates it to high speeds. What’s the first question that comes to mind when someone tells you they have discovered an exoplanet? Very likely, you want to know if it looks anything like the Earth. 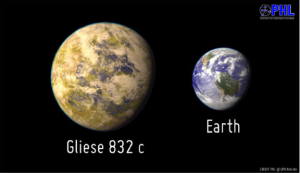 To actually answer that question, we need to not only find exoplanets but also characterize them, figuring out properties like the size of the planet, whether it has liquid water, and its atmospheric composition. Despite being such temperamental objects, variable stars can be reliable tools for probing the universe. By measuring the period of a variable star, we can learn about its composition, age, and brightness, broadly speaking. Applying that knowledge to large populations of variable stars can tell us about the structure of the Milky Way and our nearby Universe (shoutout to Henrietta Swan Leavitt and the Cepheid period-luminosity relation) as well as stellar evolution. The authors of today’s paper used the Tycho-Gaia Astrometric Solution catalogue (aka TGAS) which provides very high-accuracy velocity data for potential lens stars, and cross matched it with all of the stars in the Gaia Data Release 1 (DR1) source catalog to find any microlensing events that would happen within Gaia’s remaining lifetime. After combing through over 13,000 candidate lens stars, the authors were able to find one promising microlensing event for Gaia to detect! It turns out that we’re in for a treat on November 11th, 2019: LAWD 37, one of the closest known WDs to the Sun at only 4.6 parsecs away, will pass within a fraction of an arcsecond of a background star (with the somewhat less catchy name: Gaia Source 5332606346467258496), as shown in figure 3. If only our eyes were sensitive enough, the night sky would be ablaze with nearby astronomical structures. The Andromeda Galaxy would stretch across the sky about six times the angular width of the full Moon. The Magellanic Clouds would be fireballs tens of Moons across. The reddened molecular filaments of the nearby star-forming region Taurus-Auriga, glittering with young stars, would stretch over an area about 30 Moons across. Various studies throughout the years have established the fact that the gas giants significantly influenced the formation and evolution of our solar system. Jupiter in particular is thought to have played a considerable role in shaping the formation of the inner solar system. Astronomers believe that during the formation of the solar system, Jupiter blocked material from flowing into the inner disk, altered the velocity distribution of this material, and disrupted planet formation within several AU of the sun, leaving our solar system with no planets out to 0.39 AU. Because the gas giants played such an integral role in the formation of our own solar system, scientists are now interested in whether similar processes occur in exoplanetary systems. During a recent visit to the Dutch National Maritime Museum I came across the world map from 1648 AD by cartographer Joan Blaeu. In addition to being the first world map of the Earth that adhered to the Copernican worldview, Blaeu’s map is an extremely detailed document of the knowledge of the world at the time sourced solely from the information gathered by explorers from their travels through ages to the far reaches of the world. It’s inaccuracies and subjectivity to the western view of the world are quite amusing, but there is still a level of high detail and surprising accuracy. Through these details, it is clear that cartographers must meticulously piece together information from a large number of sources of varying reliability. Creating maps of exoplanets, also beginning to be known as Exocartography, is an equally challenging observational and mathematical problem which is addressed by today’s paper. Creating maps of exoplanets can give an idea of the presence of climatic features in the planetary atmosphere or surface which when compared to predictions from general circulations models can give us an insight into physical processes in play in their atmospheres. Observations in this context comprise of continuous monitoring of the brightness of a planetary system as different regions of the planet come into view. 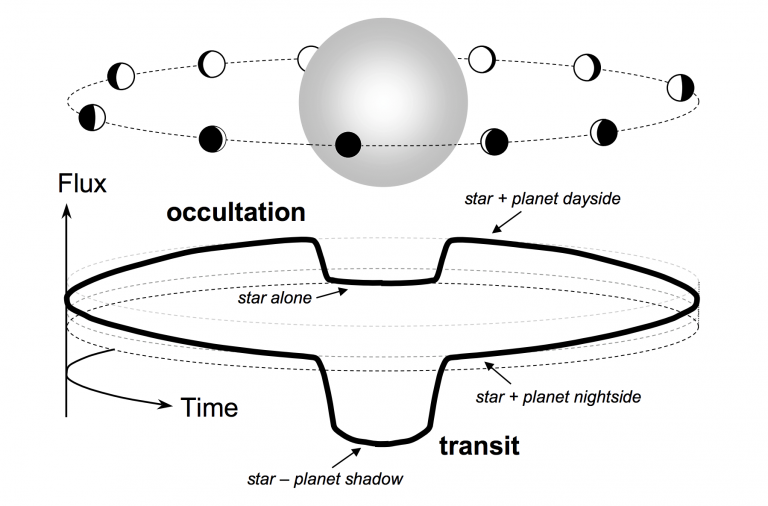 A schematic of these occultations is shown in Figure 1. Disk integrated flux (total flux from the planet’s surface which is visible as a circular disk) of the planet observed as a function of time in this way can then be converted to flux (more easily so for a tidally locked planet) as a function of spatial locations on the planet (which are coming into view as a function of time) to render a 2D brightness map of the planet for the chosen wavelength band. Since the first direct detection of gravitational waves in 2015, there’s been a large focus on the gravitational waves produced by binary systems due to their loudness and characteristic signature. Most of this attention has focused on binary systems composed of compact objects like black holes, neutron stars and white dwarfs as these are naturally the loudest events, the only binaries we know to exist in the frequency bands of ground-based interferometers…and compact objects are really cool. However, the coming space-based interferometer LISA will open up an entirely new frequency band for gravitational wave detection, and with it new progenitor systems to probe. Previous Astrobites have focused on some of these systems, such as supermassive black hole binaries, neutron star-white dwarf binaries, and even galactic binaries like AM Canum Venaticorum-type systems. However all these systems are still composed of compact and stellar, or larger, sized objects. Today’s paper takes a close look at a very different kind of binary system, an ultra-short period exoplanet, and shows that some of them should produce detectable gravitational wave signatures. Thousands of exoplanets have been discovered to date, the vast majority within the past twenty years. In comparison with more massive and compact systems composed of black holes and neutron stars, the intrinsic gravitational wave luminosity of exoplanet systems is quite weak, but for select systems that are close to Earth their proximity can make up for the relatively weak signal and can be loud enough to be detected above the gravitational wave background. In order for such exoplanet systems to be detectable in the frequency range of space-based interferometers they must have extremely short periods of order an hour or less, and to be loud enough the planet has to be quite large. 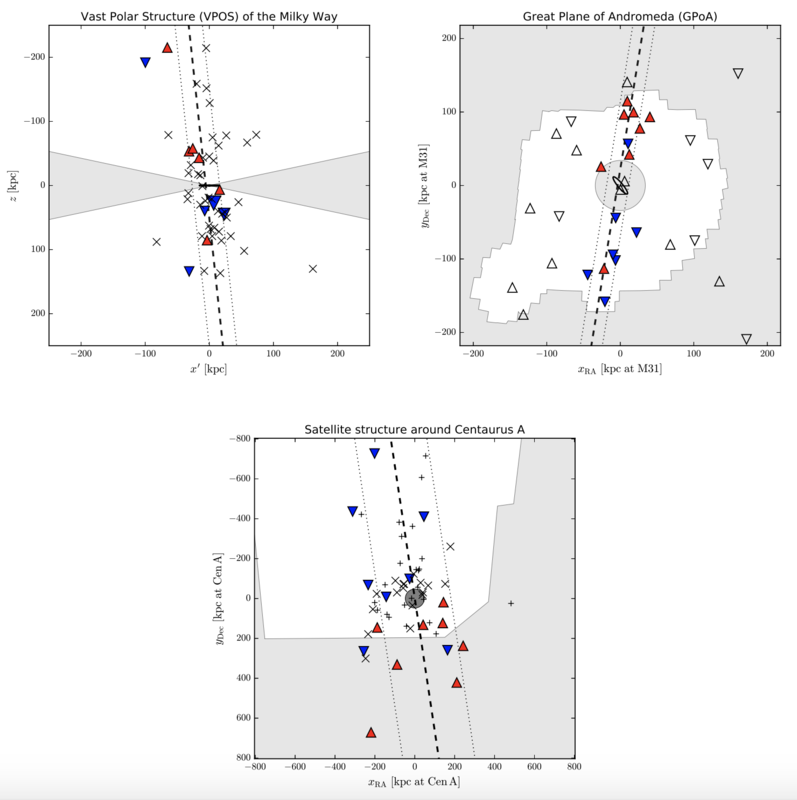 Seeing Red (and Blue): Two Sub-Populations of Type Ia Supernovae? 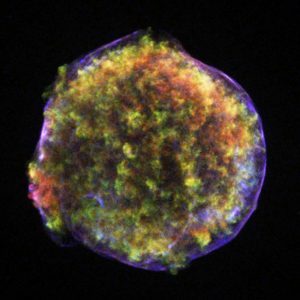 Type Ia supernovae are useful because we can use them as standardizable candles—objects whose inherent luminosity we can figure out based on various properties such as how long it takes for them to fade after brightening. Once we know their luminosity (how much light they actually emit) we can calculate their distance based on measuring their brightness (how much light we measure from them here on Earth) and applying the inverse-square law. Actually figuring out their luminosity requires some care, however. We think that Type Ia supernovae can happen in at least two different ways (see this bite from 2012 for an explanation), and astronomers using them for distance measurements need to make various empirical corrections in order to do so. In the last 2000 years, only 8 supernovae have occurred within our galaxy that were bright enough to be recorded by humans. Among these is SN 1572, which was seen in the year 1572. It was observed around the world, but is perhaps most famously associated with the Danish astronomer Tycho Brahe, who wrote a small book about it titled De Nova Stella. As an aside, the title of that book is where the modern-day terms ‘nova’ and hence ‘supernova’ come from. The appearance of a new star in the sky helped to challenge the old Aristotelian understanding that the heavens were unchanging. Even today, there is a lot that we can learn from this supernova. At the site where SN 1572 occurred, we see today a supernova remnant — a cloud of gas that was thrown off by the supernova (see Figure 1). In fact, the gas shell is still visibly expanding, as you can see in this video. By studying light emitted by the supernova and reflected from surrounding material, researchers in 2008 were able to tell that SN 1572 was a type Ia supernova. Supernovae of this type are used to measure the distances to far-away galaxies, because of their unique feature that each explosion has almost the same luminosity. We know that Type Ia supernovae are caused by exploding white dwarfs, but we don’t fully understand what triggers the explosion. There are two important models: either the white dwarf collides with another white dwarf, or it grows in mass by pulling in material from a companion star. In the second of those two models, the companion star should survive the explosion and be flung away at a relatively high speed. Apart from having a high velocity, it would look just like a normal star near the supernova remnant. Therefore, by looking for a star near the supernova remnant that might be a surviving companion, researchers can hope to tell which of the two models triggered the explosion in SN 1572. If you’ve ever seen Star Wars (the original saga), you probably remember that scene in A New Hope with the two suns. You know, Luke Skywalker is whining about being stuck on his home planet Tatooine and stomps off into the binary sunset. Two suns hover over the horizon in a way that we Earthlings never witness in our single star system. Well, this scene in the science fiction masterpiece is not so far off from reality. Planets have been found to exist around binary star systems. Whether or not there are droids and Jedi on those planets is a different story. Today’s paper examines the phenomenon of extended main sequence turn-off (eMSTO) in a galactic open cluster – NGC 2818A. To do this, the authors make use of Gaia DR2, the data gift that keeps on giving, along with archival VLT/FLAMES spectroscopy. Our first detection of gravitational waves with LIGO changed everything for astronomy. For the first time, we are able to not just look out into the Universe, but “listen” to it as well. So far, we’ve heard the collisions of the remnants of massive stars: black holes and neutron stars. The resulting data has had massive implications in fields from general relativity to nucleosynthesis. 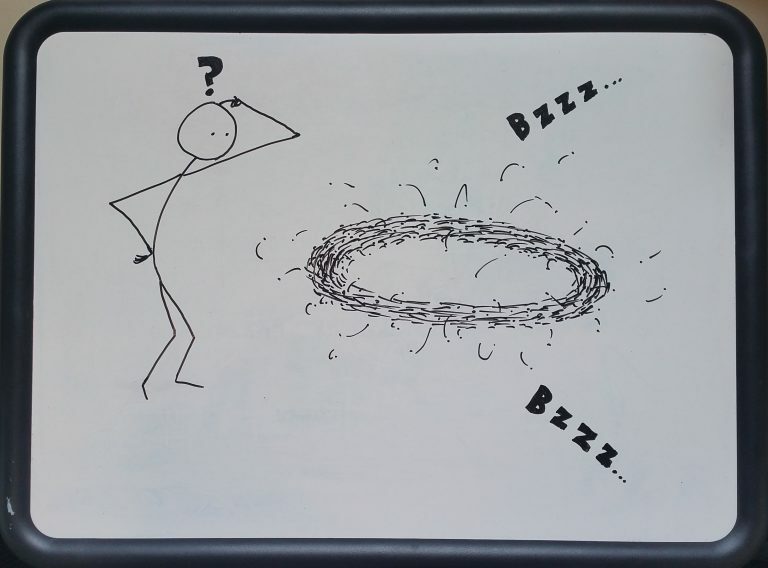 Today’s paper proposes a new use for detections of binary black hole (BBH) mergers. Vitale & Farr (2018) make the argument that if we know how often black holes are colliding, we should be able to determine how often stars form to produce these black holes.